"This is a drink with a history, a story, and a style; that's what it means to be a classic cocktail." In the Boston area, many restaurants and bars offer their own Manhattan, some more traditional while others are intriguing variations. If you really enjoy a Manhattan somewhere, and want to replicate it at home, ask the bartender about how they prepare the cocktail. Find out which specific ingredients are used, from the whiskey to the vermouth, the bitters to any other special ingredients. Also find out the specific amounts used of each ingredient so you can get the ratios correct. I want to present a handful of Manhattans you can find at local spots, some cocktails that I have enjoyed at various times. If you have your own favorite restaurant or bar for Manhattans, please tell us about them in the comments. At The Blue Ox in Lynn, they offer a Barrel-Aged Manhattan, made with bourbon, and the cocktail has been aged in a whiskey barrel for two months. The cocktail is smooth and complex, with an added depth to it. It is nicely balanced, not overly sweet, and with a mild spice element. At Il Casale Cucina Campana + Bar in Lexington, they also offer a barrel-aged Manhattan, their Meletti Barrel Aged Manhattan, which is made with Overholt Rye, Meletti Amaro, & an Amarena cherry. Instead of Vermouth, they use an Amaro, which still provides some sweetness as well as herbal elements. This was a deep and savory cocktail, with intriguing spice and herbal notes, as well as a nice bitter tinge. It is an interesting variation of a Manhattan, the Amaro working very well. Osteria Posto in Waltham offers their own Manhattan variation, also using an Italian digestiv rather than Vermouth. The Golden Age is made from Rittenhouse Rye, Cynar, Orange Bitters, and with smoked ice. It possesses a strong bitter and spicy taste with a hint of orange. Well balanced and delicious, this is a hearty winter cocktail. Chopps American Bar & Grill in Burlington offers barrel-aged Manhattans, though the specific whiskey varies. The Barrel Rested Makers 46 Bourbon made a savory and delicious cocktail, with a nice depth of flavor to it. I've had other Manhattans here and they have always been pleasing. At Osteria Nino in Burlington, you will find a more traditional Manhattan, the Nino Manhattan, which is made with Bourbon, Carpano Antica Formula Vermouth, bitters, and a cherry. 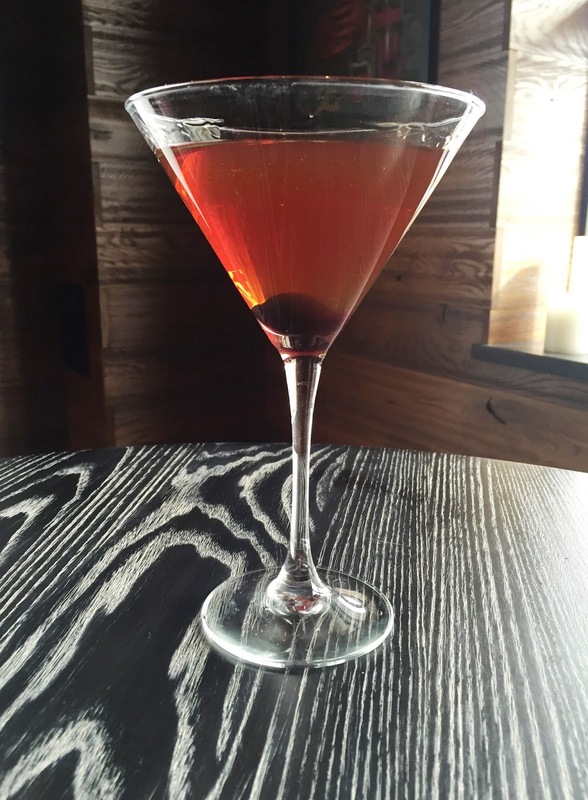 Delicious and savory, it is a little sweeter than a Rye Manhattan, but not overly so. A fine sipping cocktail.